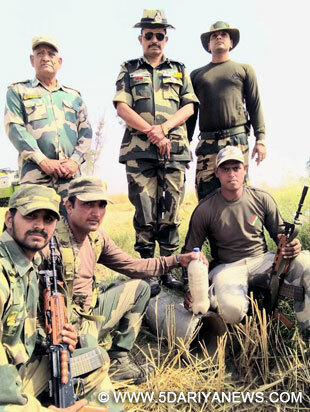 BSF troopers on Wednesday seized over two kg of heroin, valued at more than Rs 10 crore in the international market, along the India-Pakistan border in Punjab, a BSF official said.Two kg of the contraband was found concealed in a two-litre bottle of a soft drink near the Border Out Post Daoke in Amritsar sector. The bottle was hidden in a piece of pipe used for irrigation.Nearly 175 gm heroin was seized near Border Out Post Khemkaran Kasur Barrier in Ferozepur sector after troopers came across a polythene bag lying in agricultural fields. "On checking the bag, a pair of sandals was found, wherein the contraband was concealed," the official said.The BSF has seized nearly 68 kg heroin in Punjab along the India-Pakistan border this year.Punjab shares a 553-km long barbed wire fenced border with Pakistan.